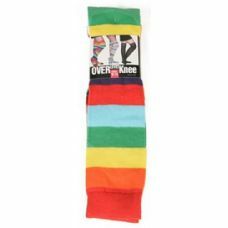 3 Units of Yacht&Smith Womens Over the Knee Socks, 3 Pairs Premium Soft, Chic Colorful Patterned (3 Pairs Retro Striped (Red, Navy, Black)) - Womens Over the knee sock at low wholesale prices. alltimetrading.com offers Womens Over the knee sock at bulk discounted prices. The over the knee high sock is a staple in every chic woman�s wardrobe. Being stylish and cute for all occasions and all season wear. Whether wearing it for a party, to go shopping, or to spend time with family & friends, pair these socks with a skirt or shorts for a colorful and fun look. Choose from colorful assorted designs and patterns to match any outfit or mood. Treat yourself to something trendy! 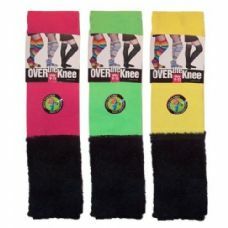 Each pack includes 3 pairs of high quality over the knee socks. Show off your fun and colorful personality with these snazzy designs and colors. Wear these with sneakers, shoes, or boots for a very chic look. 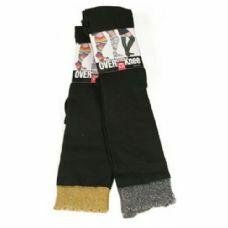 Can also be worn in the winter time to add an additional layer of warmth while keeping your legs feeling nice and cozy. Made with a soft fiber blend that ensures comfort even through many hours of wear. Being non-abrasive to the skin and offering a premium softness, these over the knee socks will become your go-to day to day socks. Features a durable and comfortable stretch for a perfect fitment. A breathable texture allows your legs to stay cooler and fresh on a warm day. A stay up top ensures that your sock does not slide off ensuring that you are looking sharp throughout the day. The anti-itch fabric also helps to keep an optimal temperature making them great for sports or athletic wear. SATISFACTION GUARANTEED: Buy with confidence and get a 30-DAY MONEY BACK GUARANTEE. If you are not satisfied with our socks, please contact us and we will respond within 24 hours. Your satisfaction is our top priority. Sock size 9-11 will fit women�s shoe sizes 5-10 (US). Made with 80% cotton and 20% spandex. Get the perfect pair of over the knee socks for everyday wear. Whether treating yourself or getting it as a gift for a friend or loved one, choose from colorful and fun patterns and designs. Look chic with the solid colored styles or fun with the patterned designs. Pair these with your favorite skirt or shorts for a fun and cute look. Or wear these in the winter time to add an additional layer providing you with warmth and comfort. Show off your fun-filled personality and lifestyle with these fun socks. Can be worn with sneakers, boots, or shoes and it will still be just as stylish. Over the knee high socks are a must have in every woman�s wardrobe. Perfect for most occasions including going to work in, partying, having dinner, sports, and much more. Featuring a premium soft texture which offers extended comfort along with durability. The anti-itch properties ensures an unmatched comfort that not only brushes up softly on the skin, but also provides breathability. It helps to keep an optimal temperature at the feet and legs. Sock size 9-11 will fit women�s shoe sizes 5-10 (US). One size fits most women. Choose from regular or Raw Cut over the knee high socks. The Raw Cut features a retro 80's style cuff as shown in images. Made with fine fibers including. Provides a premium stretch for a comfortable fit. Made with 80% cotton and 20% spandex. SKU: 1950833 Free same day shipping. SKU: 2012905 Free same day shipping.